'What Next? '- I love my son, but his mental illness scares us all. ‘What Next?’- I love my son, but his mental illness scares us all. I gave birth to my son William, my third child, when I was 22 years old. I had placed my first two children in foster care because I was dealing with an abusive boyfriend and we had nowhere safe to live together. During my pregnancy with William, I was living in a domestic violence shelter and trying to get housing, but I felt more stable. I had a good job and I worked hard until we finally got out of the shelter when he was about one year old. We went to the park together and played on the swings. We listened to music and danced, played games, watched movies. The way he danced, you had to laugh, because he looked so funny and cute. We were so close. He had trouble with listening sometimes. When I’d tell him, “It’s time to stop and get ready for dinner,” he would give me trouble. But it was normal behavior. When he was about 5 years old, though, William started to become a handful. His behavior grew very serious. He wouldn’t sleep, he could not focus, he would hit children and adults, he would bite people, and he once took a hammer and hit my friend in the head with it. I mean, we would get kicked out of places because of his behavior. I was stressed and had no support, no help, not even from his father. I was crying a lot. I wanted to let William know that his behavior had consequences, so I gave him “time outs.” If he threw something, I would give him five minutes in a chair – one minute for each year of his age. “OK, Mommy,” he would say. He would give me the mean face, but he listened. Once I started doing that, he would listen, because he wanted his toys and he really wanted to go outside. I thought to myself, “Maybe he just needs something to do,” so I registered him for pre-kindergarten. At first it was good for the both of us, but then he started having problems. He was kicking, biting and hitting teachers and kids. I was called down to the school for a meeting about his behavior. They told me my son had signs of having Attention Deficit Disorder with Hyperactivity (ADHD), so they set up an evaluation. After that, at a meeting at the Department of Education, they told me my son had ADHD and needed to be put in a special education class. So I filled out the paper work to get my son into a school that could help him, and they found a school that was willing to accept him. At the new school, William got the services he needed, like counseling and medicine to control his outbursts. He had his ups and downs, but the school worked with him and my son got through the year. I was so proud of my baby. I was in tears because despite all we went through, my baby made it. But when he moved on to a different school, William’s problems started again. At home, his behavior was OK, but at school he was throwing chairs and hitting other children. I tried talking to my son, but William wouldn’t talk much, so I didn’t know what was wrong. I kept talking to him and spending more time with him—going to the park, going to friends’ houses so he could play with kids his age. Nothing seem to help. I would ask him, “What’s wrong?” and he would say, “Nothing.” If I kept at it, he would not respond. He would hide his feelings. I even tried therapy. He still would not talk. The new school was no help at all. They just called me to pick him up when he acted out. His doctor changed the medication but that really didn’t help. When he was 7 years old, he started having problems at home, too. One morning I woke up and my house was on fire. My new baby girl was all blue in the face from the smoke (luckily she survived). I took him to the hospital and the doctors admitted him. Even though I didn’t want my son in a psychiatric hospital, I knew it was best for him at that time. Every time I went to visit it was hard, especially leaving. I didn’t want to leave him there. My son was there for a month. When they let him come home, I was happy and so was he. But when he started having problems again, I decided to move. I lived in a bad neighborhood with drugs and shootings, cops on every corner. I started looking in Queens and found a nice place in a nice neighborhood. I also found a new school for my son. I felt like I was finally more in control. He still was having problems, but this school helped him apply to a day treatment program. There was a process to get him in. During the wait, he was admitted to the hospital twice because his behaviors were out of hand. Finally, the hospital got him into day treatment, where he had doctors and counselors. My son had his bad days and his good days, but his behaviors were not improving. Eventually they had my son admitted to the hospital. During this admission they diagnosed my son with bipolar disorder, and ADHD and started him on the right medicine. They also decided he needed to be in a long term hospital and transferred him. At this point, I was totally stressed. I didn’t know what to expect. We were going through so much I didn’t know what was next. I didn’t know what to do. I really didn’t have anyone I could talk to. I tried not to cry but one day I broke down in tears. Crying helped a little but I really needed someone by my side. At the long-term hospital, they decided to do some testing. I agreed because I wanted to find out what was going on with my son. After the testing, they told me my son had a mood disorder, psychotic disorder, oppositional disorder, as well as ADHD and mixed receptive expressive language disorder, which he’d been diagnosed with before. They also said he had lost hearing in his left ear. I said to them, “My child is only 9 and he’s going through all this? How can he have all these problems?” The doctor just told me it was generational—passed down in a family’s genes. Finding out all this was so overwhelming for me. When the doctors were explaining their diagnosis, I was in tears. They gave me some literature so I could read up on mental illness. They also suggested that I join a women’s support group and get myself some counseling because I was dealing with so much, and I did. 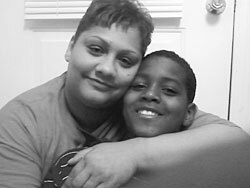 After that, my son started to get the help and services he needed: counseling, speech, and more. I also got homemaking services, which is when someone comes to the house and plays with the child and gives the mother a break. I could go out and get a breather from all my children for a few hours. Those services were really good. My son started doing much better. He started to come home on weekend passes. After a long year, William was ready for discharge. I checked out a school called the Life School. The staff knew everything my son needed and were willing to work with him. They accepted him on a trial basis to make sure the school was right for my son. The hospital also set him up with outside counseling services. On March 30, 2007, William came home. I was so happy to have my baby home again. I was scared as well, because he wasn’t with me for a year so I didn’t know what to expect. When he first came home, he was not doing good. Then we had a week when he seemed to be doing better at home and school. I was happy about that. I told myself, “Deal with the stress, because if your children do not have you, they have nobody. Just try to keep busy so you don’t overwhelm yourself.” I really thought the worst was over. But it wasn’t. One morning not long ago, I got a phone call from the school telling me William was flipping out. He was throwing chairs, he punched a kid in his face, and he attacked a teacher. They suspended him for a day but I decided not to let him go back until he was evaluated by a doctor. One day not much later, he went after me, so I had to call the police, which I really did not want to do. I didn’t want to see my baby back in the hospital. But that’s where he ended up. At this time, I had a boyfriend, so I was able to lean on him and he was really supportive. That helped a lot. For a few days, William was doing OK. He even apologized to everyone. I tried to explain to him, “William, this behavior is going to get you put in back in the hospital.” That calmed him down for a moment. Then I was sitting there eating breakfast when my daughter screamed, “Mommy, watch out!” My son was in my face with a knife, threatening to kill me. I had to think fast. I told him, “Think about what you’re doing. If you hurt me, there is no going back.” After he gave me the knife, I felt relieved, but then he started chasing my daughter with a stick. My sister screamed, “Now he has a small knife!” She was so scared. All she could do was jump up and down saying, “Please don’t kill me.” I put myself between them, and William put the knife down and ran out the door. Scared as I was, I ran after him. Finally he calmed down. When the police arrived, William tried to run but they cornered him and got him to go to the hospital. I’m not going to lie. I didn’t want to go to the hospital with him. I was so angry. But I went. I’m his mother. “I’m not sure,” I said. I was quiet because I was in shock. I was thinking, “This is not my son. My child would never do this.” But he did. The hospital had him admitted. When I got home, my two other kids and my boyfriend were up waiting for me. My children didn’t want to go to sleep until they saw I was OK. My boyfriend had gotten me flowers because he knew I’d had a hell of a day. The next day I was supposed to go to the hospital but I didn’t. I could not find the strength to go. I was so angry. But after two days I did and I talked to the doctors. They said he can’t come back home. He has to go into a different hospital for a longer stay and then go to a residential home. I still want him home. I’ve been trying to fight for him with no luck at all. Now they’re telling me that I have to sign the papers admitting him to long-term care or they’re going to get ACS involved. I don’t know what I’m going to do. This is so hard for me. At this point, there seems to be no good answer for my son and me. I hope that we’ll find a way through. I just can’t imagine how.